You can't tell, but there is another row of books behind that jumble. 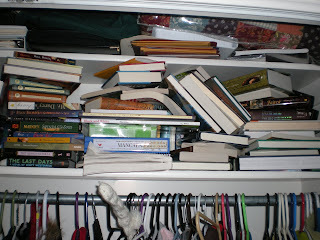 Then I have another shelf that looks just like that, and a smaller bookcase stuffed to bursting. Anyway, that's my current dilemma. I'm going to try and stack them into neater piles at least. Neater piles is a good start; it will at least give the semblance of more space. If you have an attic, you can pack up some older books that aren't your favorites. I have about two hundred books in storage. If you have room under your bed, you could also box some books and put them under your bed so they're out of the way but still convenient. Depending on how your room is decorated/arranged, you could maybe run shelves around the top of your room. It might make the books hard to reach, but it would probably look cool. Good luck! I have to redo my shelves too; I'm out of space so I'm going to have to start stacking or maybe move some books to the attic. Ha; that looks exactly like my room. I'd start by putting them into neater stacks. After that, if you have room under your bed, put them in boxes and under there. If not, do what I started doing and just stack them in random places around your room. :p It really works. lol. I laugh because I have the same problem. I did buy two bookshelves last summer, and now they're completely full. If you're looking for cheap bookshelves, see if you have an IKEA in your area. The "as is" department often has bookself units for like 20 buck because the boxes were damaged (or something like that). There is an IKEA nearby... I'll have to check that out. (Oh yeah, btw, the two "The" comments were mine - I accidentally signed in with a different email account for some reason...oops). Well, I usually get an ARC a week, sometimes fewer. It depends on the week. And sometimes my grandma will take me book shopping, but that doesn't happen all too often. Maybe I was exaggerating the tiniest bit. Indeed, wasn't that thing amazing? I don't have any books at all strangely. I do have one small bookshelf but I get almost every book I read from the library. It's the guaranteed no clutter way to get books! My bookcase looks something similar to that! The reality is that I need another bookcase, but for now I put up with books stacked in rows two deep and on top of each other etc. I need a new booshelf as well..it's full. and there's about a hundred books stacked beside it. Except my mom hates the idea of me reading so obviously she won't get me one. And she also won't let me buy books. It a place where people put up used stuff they want to sell. There's also a place called Freecycle, I'm not exactly sure how it works though, but my mom knows . . .